This PMR study offers an eight-year analysis and forecast for the global castor oil & derivative market for the period of 2018 to 2026. The report considers 2017 as the base year, estimates values for 2018 and presents a forecast for the assessment period between 2018 and 2026. The Compound Average Growth Rate (CAGR) has been represented from 2018 to 2026. This PMR study covers several perspectives of the castor oil & derivative market and market dynamics, value chain analysis and key trends prevailing across the value chain, pricing analysis based on the segmentation, competition analysis, regional and segmental growth comparison, forecast factors, macro-economic factors, project cost analysis, porter’s five analysis and industry growth analysis, along with segment-level projections in a comprehensive manner. On the basis of value, the global castor oil & derivative market is expected to expand at a CAGR of 4.5% between 2018 and 2026. This Persistence Market Research report analyses the castor oil & derivative market at a regional as well at global level through market segmentation on the basis of key parameters such as classification, derivative grade, application and region. The key objective of the study is to offer key insights on the market updates, competition positioning, market potential, current trends, growth rate and other relevant information and statistics in a suitable manner to the readers or stakeholders in the castor oil & derivative market. Castor oil, extracted from the castor seeds, is a colorless to pale yellow liquid with mild or no taste. It is used in various industries such as biopolymer, personal care, food, lubricant, plastic & rubber, paper, pharmaceutical, paint, ink, and additive. Attributing to the various uses of castor oil in different industries and pharmaceutical applications, the market demand has escalated over the past few years. All chemical derivatives of castor oil find numerous uses in industrial applications. The report is structured to allow readers to develop a thorough understanding of the castor oil & derivative market. The report begins with an executive summary, followed by the market definition, market taxonomy, market background, market analysis by key segments, regional analysis and competition landscape. Each section of the report covers a qualitative and quantitative study of the castor oil & derivative market on the basis of historical developments, key opinions of industry experts and current trends in the market. The study begins with a market introduction, which provides the market taxonomy and definitions with respect to the global castor oil & derivative market. The second section of the report describes the market background, macro-economic factors, allied industry factors, forecast factors, weighted average pricing analysis and value chain overview covering approximate margins. The next section of the report discusses market dynamics such as drivers (supply and demand side), restraints and trends impacting the market growth at a global level. The market opportunities or potential for manufacturers have been presented in the subsequent section of the same chapter. This section also includes the impact assessment of market dynamics on the global castor oil & derivative market at a qualitative level based on facts and insights. Subsequent sections of the report provide value (US$ Mn) and volume (Tons) projections for the castor oil & derivative market for the aforementioned segments at a global level. The global market values represented in these sections have been agglomerated by collecting data and information at a regional level. The castor oil & derivative market information, along with key facts and insights, covers unique analysis frameworks, such as absolute $ opportunity analysis, year-on-year growth trend comparison, market share and attractiveness analysis for each of the types covered in each segment. As previously highlighted, the castor oil & derivative market has been split into a number of segments. All the castor oil & derivative segments on the basis of classification, derivative grade, application and region have been analyzed on the basis of basis Point Share (BPS) to understand each individual segment’s relative contribution to the market growth. This detailed level of information is important for the identification of various key trends witnessed in the castor oil & derivative market. In order to understand the key market segments in terms of the growth and installation of castor oil & derivatives across concerned regions, Persistence Market Research has developed an attractiveness index, which will help providers identify real market opportunities. In the final section of the report, a competitive landscape of the castor oil & derivative market has been included to provide report audiences with a dashboard view categorized on the basis of providers present in the value chain, their presence in the castor oil & derivative market and key differentiating factors and strategies. The primary category of providers covered in the report include castor oil & derivative manufacturers. This section is primarily designed to provide clients with an objective and detailed comparative assessment of the key providers specific to a market segment in the value chain of the castor oil & derivative market. Report audiences can gain segment-specific vendor insights to identify and evaluate key competitors on the basis of in-depth assessment of their capabilities and success in the castor oil & derivative marketplace. Detailed profiles of providers have also been included under the scope of the report to evaluate their long- and short-term strategies, key offerings and recent developments in the castor oil & derivative market. Examples of some of the key competitors covered in the report on the castor oil & derivative market include The Castor Oil Industries Ltd, Ambuja Solvex Pvt Ltd, Arvalli Castor Derivatives Pvt. Ltd, Royal Castor Products Limited, Jayant Agro Organics, Gokul Overseas, Adani Group, Hokoku Corporation, NK Industries Limited, Alberdingk Boley, Outa Earth Processors Ltd, Kanak Castor Products Pvt., Ltd and Xingtai Lantain Fine Chemical Co., Ltd. The castor oil & derivative report covers comprehensive information about the trends, volume (Tons), & value (US$ Mn) projections as well as market dynamics, competition and recent developments in the global castor oil & derivative market for the study period 2018 to 2026. 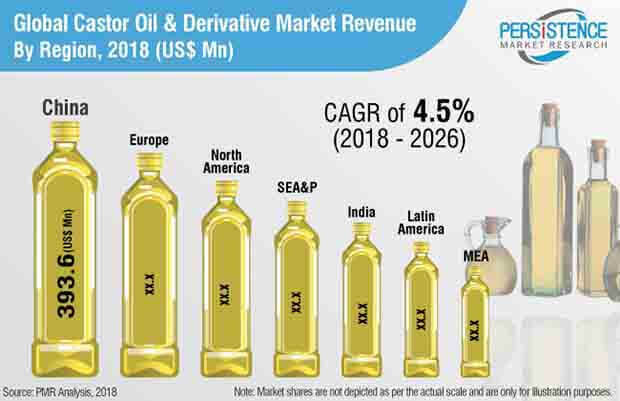 The global castor oil & derivative market is estimated to reach US$ 1,559.4 Mn by the end of 2026 while registering a CAGR of 4.5% for the same period. The factors which augment the growth of castor oil & derivative market are end use industry growth, increasing disposable income and favorable government policies. Owing to growing awareness about greenhouse gases (GHG) and deforestation, demand for alternative feedstock is growing. Continuous availability and renewability of castor oil will deliver ecological demand for the product in the coming future. Castor seeds contain more than fifty percent oil. They produce more than 140 gallons of castor oil per acre. These factors are anticipated to create more opportunities for biodiesel production in near future. The demand for Castor oil is expected to increase as a result of rapid urbanization, growing middle-class and increasing demand for sustainable products. Increasing purchasing power, growing economic prosperity and affordability of products has resulted in growth in demand for consumer products, such as personal care & cosmetics. Sound growth of end-user sectors is projected to fuel the demand for castor oil over the forecast period. The positively growing healthcare landscape is changing rapidly. Various factors, such as changing food habits, lifestyle and sleeping disorder, are contributing to this change. Globally, people are getting more health conscious and thus, the demand for pharmaceuticals is increasing across the globe, which in turn, is leading to high consumption of solvents & other chemicals used in pharmaceutical and healthcare industries. The young generation is investing heavily to attaining better looks, grooming and styling. The demand for natural cosmetics & personal care products has been driving innovation in the cosmetics sector across the globe. The demand for cosmetics & personal care products with natural ingredients is expected to rise in the coming years with consumers becoming more concerned about personal care and the ingredients found in them. This, in turn, is expected to surge the demand for castor oil derivatives from the cosmetics & personal care industry, which will provide impetus to castor oil derivatives in the market. The global castor oil & derivative market is highly consolidated as India is the only key market for castor oil production globally. The top six key players in the castor oil & derivative market are estimated to hold almost two-third of the market volume share by the end of 2018. In the last couple of years, the castor oil & derivative market has witnessed lucrative developments. Acquisitions, capacity expansions and collaborations are some of the favorite strategies opted by key manufacturers to sustain in the global castor oil & derivative market. Some of the prominent players covered in this study of the castor oil & derivative market are The Castor Oil Industries Ltd, Ambuja Solvex Pvt Ltd, Arvalli Castor Derivatives Pvt. Ltd, Royal Castor Products Limited, Jayant Agro Organics, Gokul Overseas, Adani Group, Hokoku Corporation, NK Industries Limited, Alberdingk Boley, OUTA EARTH PROCESSORS Ltd, Kanak Castor Products Pvt., Ltd and Xingtai Lantain Fine Chemical Co., Ltd. etc. How has the castor oil & derivative market evolved over the last couple of years? In terms of value and volume, what shape will the castor oil & derivative market take in near future? What are the market dynamics in the castor oil & derivative market? What are the key trends and developments being witnessed in the castor oil & derivative market? What are the industry and macroeconomic factors impacting the progress of the castor oil & derivative market? What are the opportunities, challenges and improvement aspects for key players in the castor oil & derivative market? The Castor Oil Industries Ltd.
Arvalli Castor Derivatives Pvt. Ltd.
Kanak Castor Products Pvt., Ltd.
Xingtai Lantain Fine Chemical Co., Ltd.